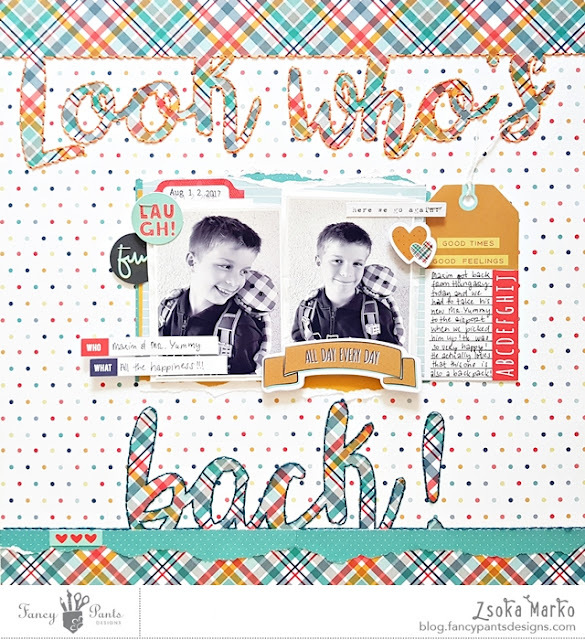 I'm back with another layout I made for Fancy Pants with the awesome Family&Co collection! 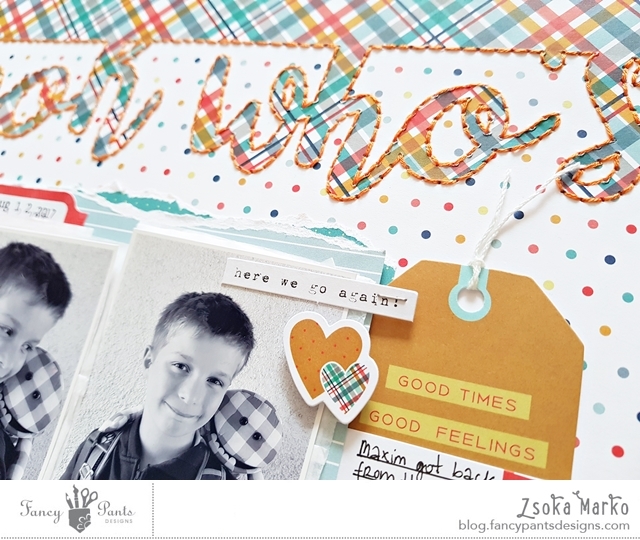 This plaid paper is my absolute favourite! I love the bright colors in it. I decided to go with a die cut title. I just selected a font and then typed up my title. I drew two rectangles and welded my letters with them, one for the top, one for the bottom of the layout. I glued these in place then hand stitched around them, using two different color floss, orange and dark teal. My son lost his favorite toy, a hand puppet called Mr.Yummy (actually he is called Mr. Jummy in Dutch - he was the mascot of Sultana in Holland) during our summer holiday. He was so extremely upset, he just kept crying for days. We were all heart broken because I got Mr. Yummy when I was pregnant and he was with Maxim for almost 9 years. The hotel didn't seem to care very much so I contacted Sultana and told them about what happened. They didn't have the hand puppet we had but they had one that is a backpack and a hand puppet in one! They mailed it to Maxim's grandpa in Holland, his dad picked it up and when Maxim arrived back from my parents' we took it to the airport with us. He was sooo very happy, he just kept saying how adorable Mr. Yummy is :). We are incredibly grateful to Sultana! This is what this layout documents. I printed two 3x4 photos and placed them in the middle of the page. I layered some tissue paper and different patterned papers behind my photos to mat them. Then I added some die cut pieces around my photo and used a tag for my journaling. Actually I combined two tags to make my own. I'm back today with a new layout I created for Just Nick. I chose the Graphic Background cut file for this. I have used this cut file before, but not in a long time, so I thought why not use it again? I went with white card stock again, like most of the time... 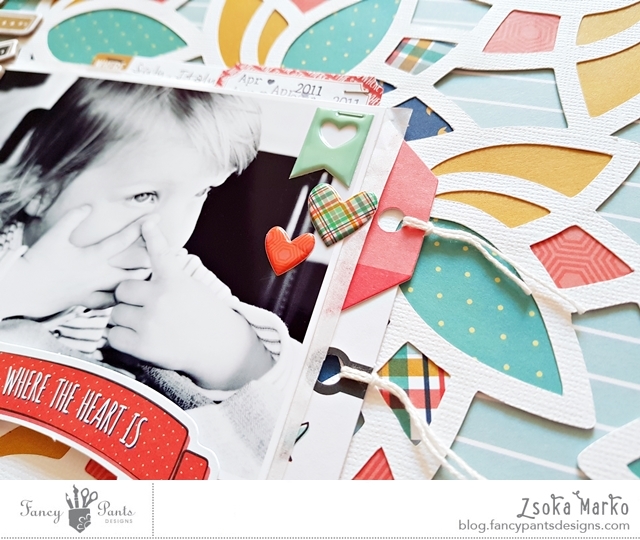 I picked the wonderful Cocoa Vanilla Wild at Heart collection for this layout. I love this navy floral paper and I thought the white cut file looks great on it. I stitched down each part of the cut file with navy thread to add some interest. 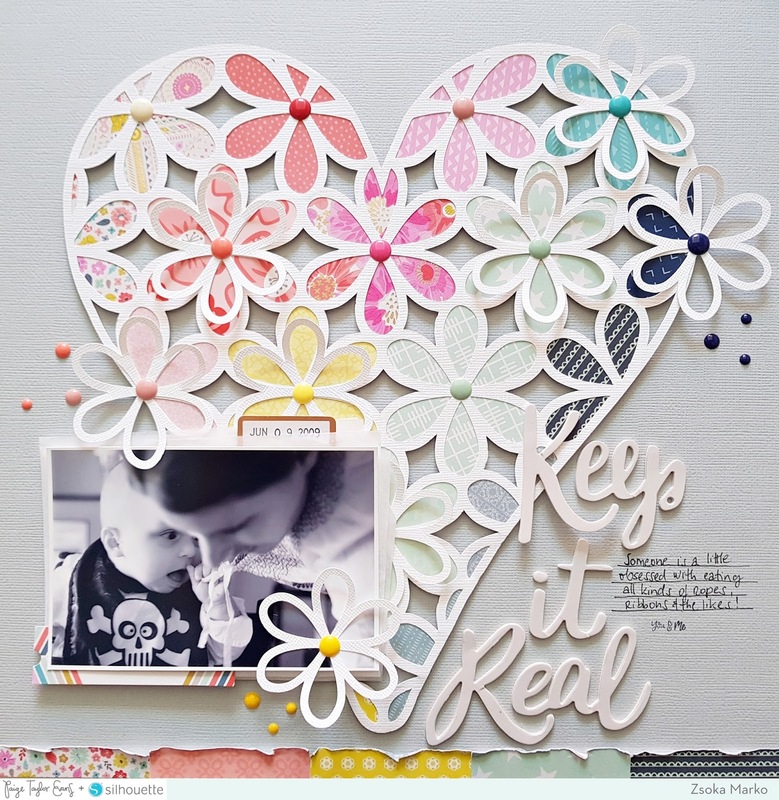 I placed my photo a bit off center, to the right, and layered a few pieces of die cuts, chipboard frame and tissue paper behind it. Then I started embellishing. I wanted to keep all embellishments around the photo so that most of the background is still visible. I added lots of die cut flowers; some of them I glued down with liquid glue, others I popped up with foam adhesive to create dimension. I really love dimension on my layouts! I also used flair buttons, stickers, chipboard pieces and some resin flowers from one of the earlier Cocoa Vanilla collections. I think those are my favorites, so cute right? 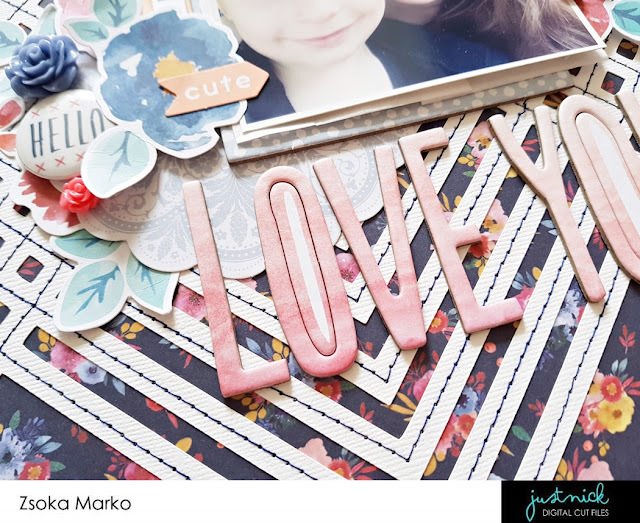 I know the title is not very original, but I love the way these big chipboard letters look and well this title does fit my photo so why not? With the amount of layouts I make it's hard to come up with creative titles, especially ones that are short (because I prefer them short). So I end up with a lot of Sweet, Cute, Love, Awesome etc titles I'm afraid, especially if the photo just captures a candid moment, not any special event. 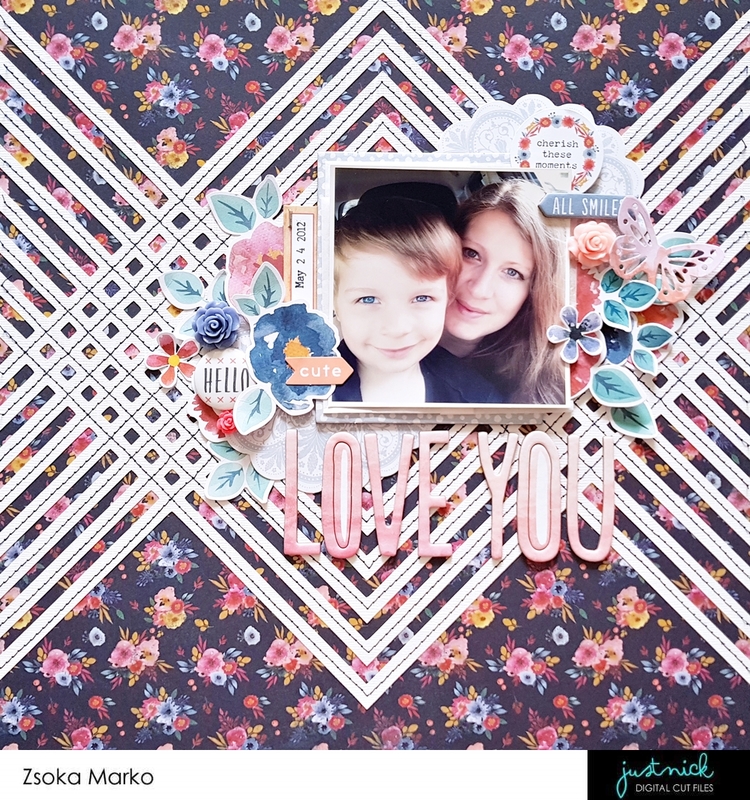 Other than the stitching, which took a bit of time, this layout came together very quickly, which is unusual for me! I really like how it turned out, I hope you do too! 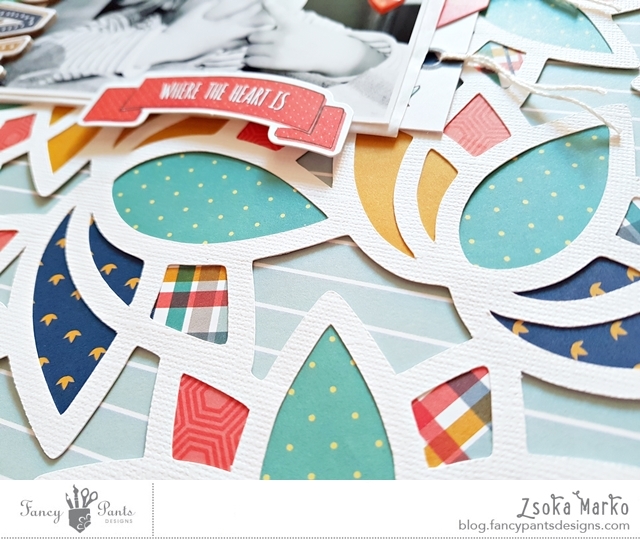 I'm back today with a couple of simple cards I created using some awesome cut files from Paige Evans. 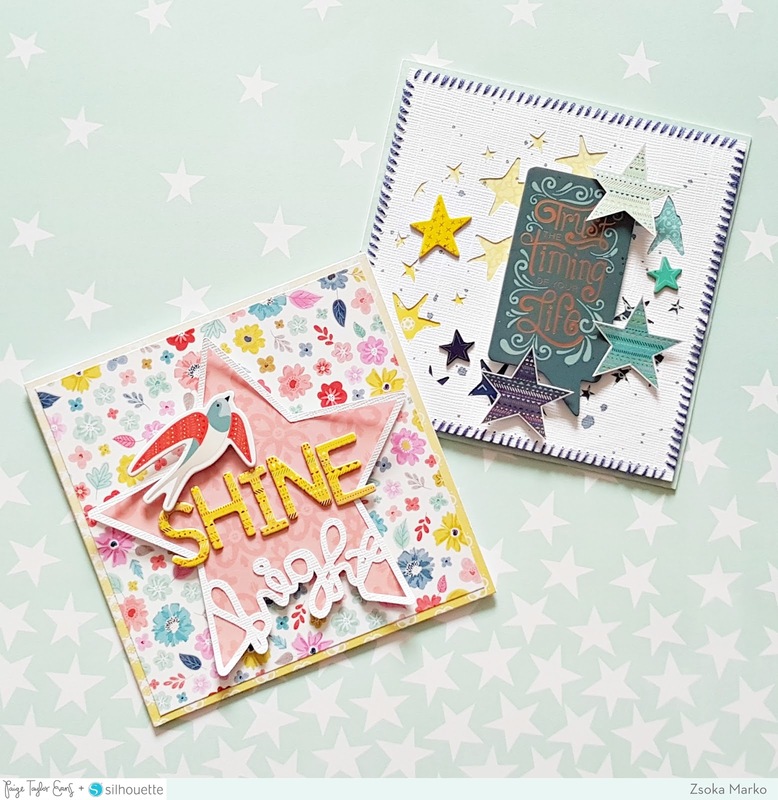 I thought I'd pick the same theme for both cards and I went with "Stars". The two cut files I picked were the Spooky Stars and the Bright Star. Both cards are 5x5" (and both have a slightly smaller, 4.75x4.75" square layered on top of them). I sized the cut files accordingly in the Studio program and cut them both from textured white card stock. I did modify the Spooky Stars cut file a little: I cropped the star background into a circle. I chose a couple of papers in yellow-green-blue tones and backed the stars with these. I then hand stitched around the edges of the white card stock to add some interest. I chose a chipboard sentiment for this card which I placed on foam adhesive. I then added some fussy cut and chipboard stars plus some dark blue ink splatters. To finish off my card I adhered the white card stock to a mint patterned paper base. For my other card I sized down the Bright Star cut file to fit my background. I backed it with a coral patterned paper. 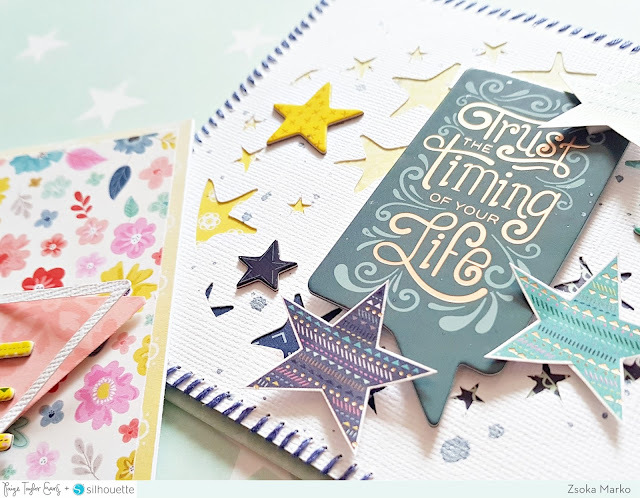 I glued a floral patterned paper square on my yellow card base and placed the big star on foam adhesive to give the card a bit of dimension. 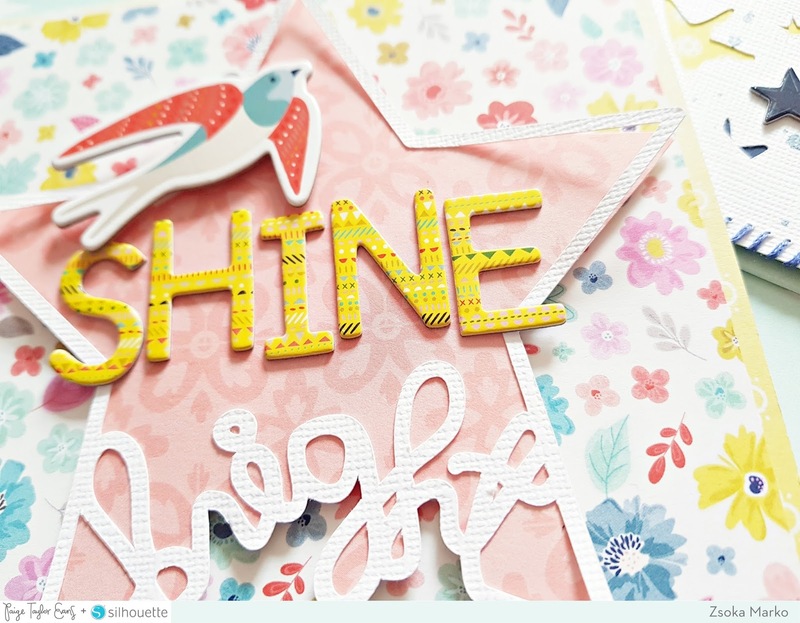 I chose SHINE (bright) for my sentiment and used some of the Turn the Page chipboard alpha stickers for this. 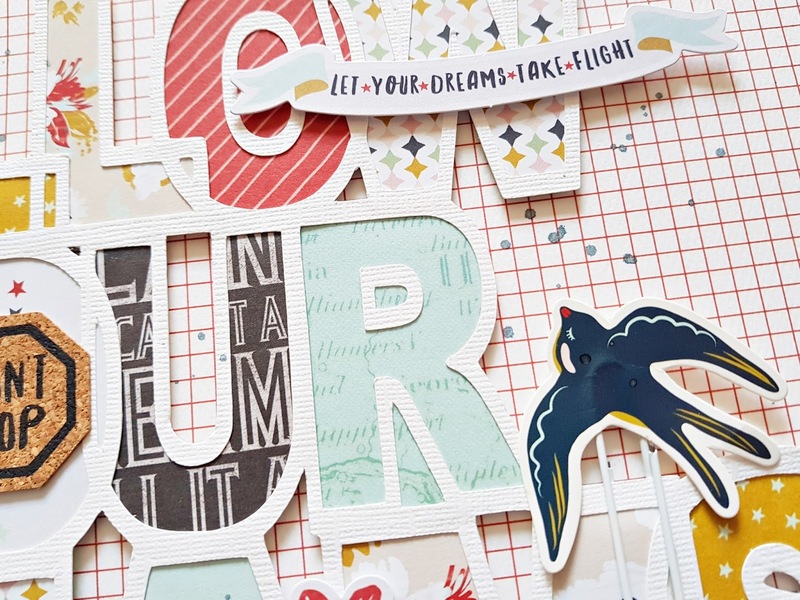 I added a chipboard bird above my sentiment and I was done. 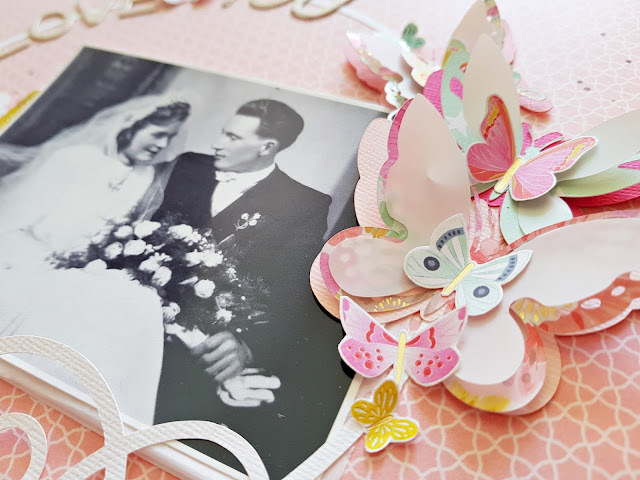 These are very simple cards that you can do in no time, last minute, when the other hundred cards you have don't fit the occasion (yes, that happens to me every single time). 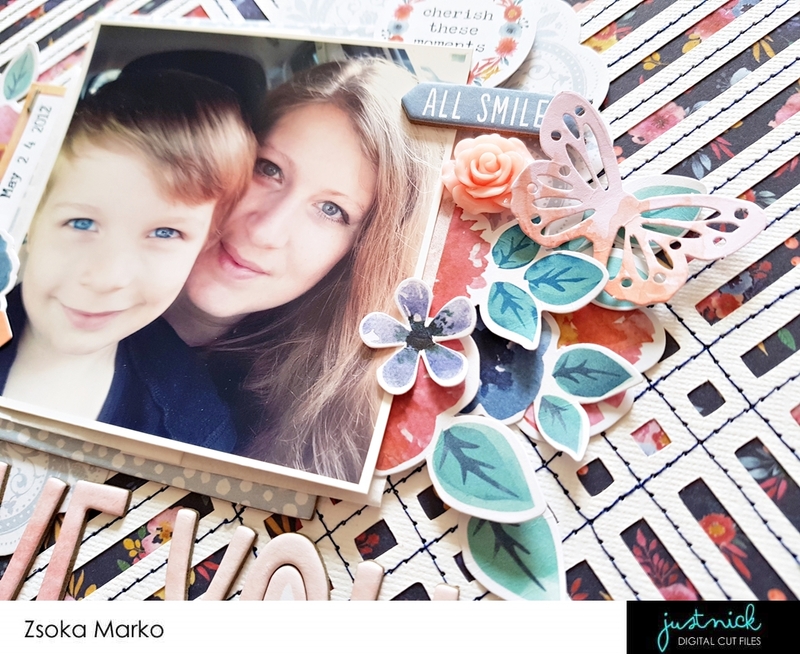 I hope I could inspire you to create some handmade cards for your loved ones, no matter how they turn out, in my experience everybody is happy to receive them! 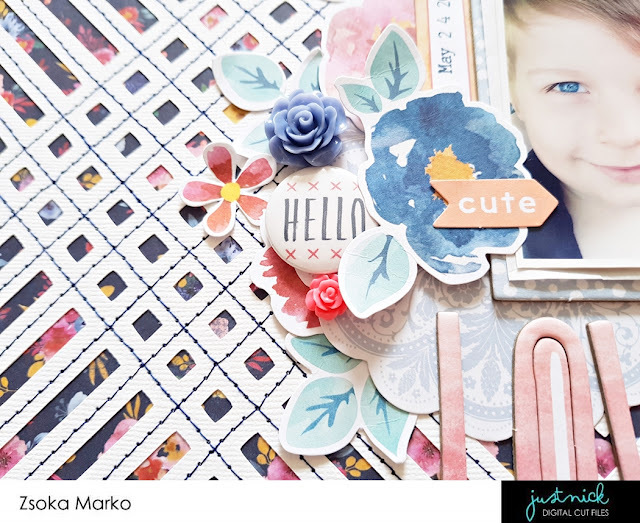 I'm back with you today sharing my newest layout I created with some awesome Just Nick cut files! 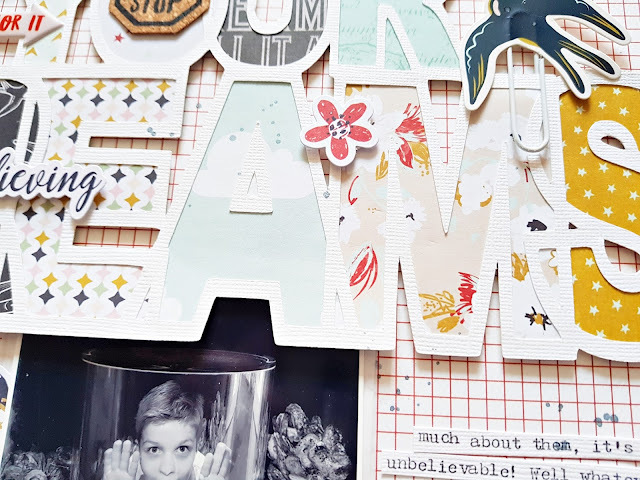 We are showcasing words/sentiments cut files this week and I picked the Dream Big cut file for this. I blew up the cut file and also stretched it because I wanted to have taller letters and cut it out from white card stock. I picked one of the last Fancy Pants collections for this layout, Dream Big, which fits my title and my theme. The background paper is a very old Theresa Collins paper I believe. 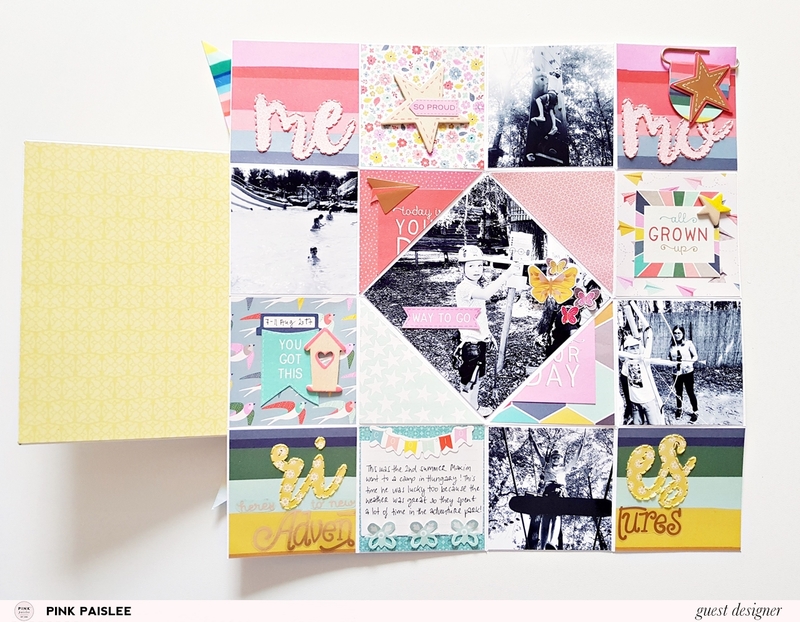 I love grid papers for backgrounds! They are subtle but still not just plain card stock. 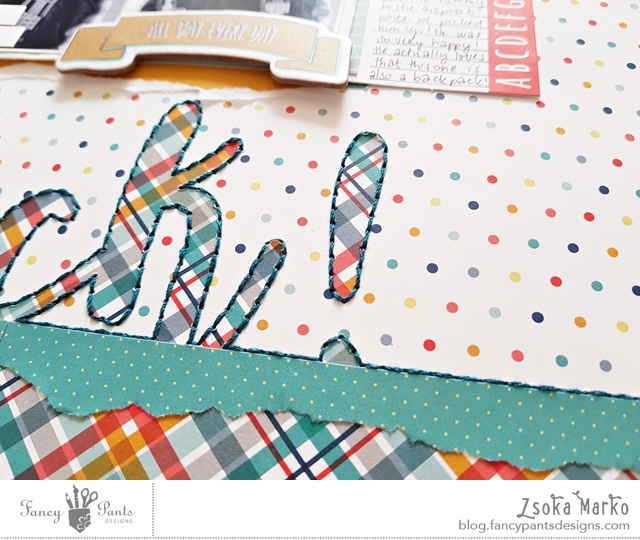 As usual, I backed the letters with different patterned papers. This is actually one of the reasons I love cut files, one can showcase many colors and patterns without them being too busy or overpowering. I then added foam adhesive to all the letters and tucked my photo in at the bottom of the cut file. About the photo I chose...We visited the Audubon Aquarium of the Americas in New Orleans, because my son is crazy about animals. He loves sea creatures especially. He always wanted to work with animals when he grows up, his latest dream is to be a marine biologist. I just wrote about how I'm sure this is going to change a million times and of course that is OK, he has plenty of time to decide! I adore how much he knows about every single animal! I honestly have no idea how he keeps all that information in his head. Kids' brains are fantastic! They just remember absolutely everything. Well other than how to clean up their rooms of course :D.
I typed up my journaling and cut it into strips, adding them in the spaces on both sides of the photo. I normally just write my journaling with a pen but I thought this would stand out more. 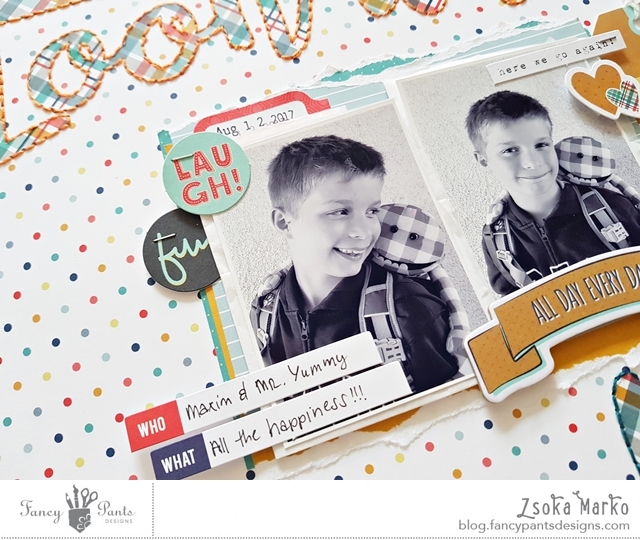 To embellish my layout I chose a few items from the same collection, die cuts, puffy and cork stickers and a clip. I added foam adhesive to some of them to create a bit of depth. I wanted to add a bit more red to the layout (red, my least favorite color no less!) so I tore off a strip from one of the patterned papers and adhered it to the bottom. To finish off my layout I added a few navy blue ink splatters. 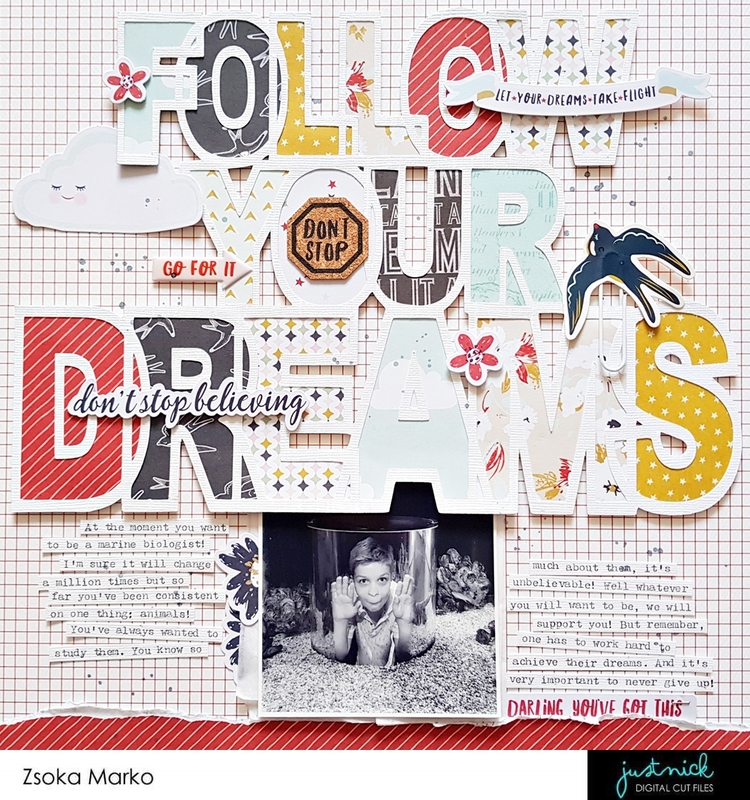 I hope you like this layout and are inspired to document your children's dreams! 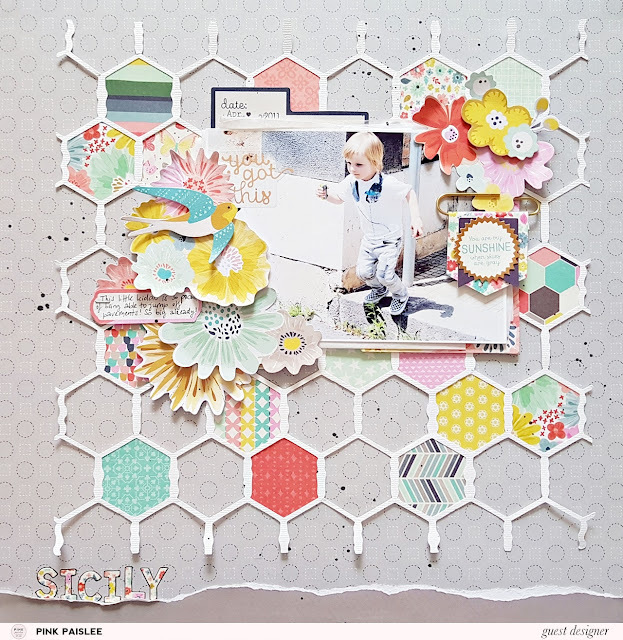 I'm popping in today with a new layout I created for Fancy Pants! I haven't worked with the awesome Family&Co collection yet (which by the way is on sale now at Make a pretty life), so I thought it was about time I do! I love the colors in this line! I've wanted to use the Lotus lace background cut file from Just Nick in like forever, and I was determined to make it work even though it has nothing to do with my photo. But actually more often than not I use random cut files. 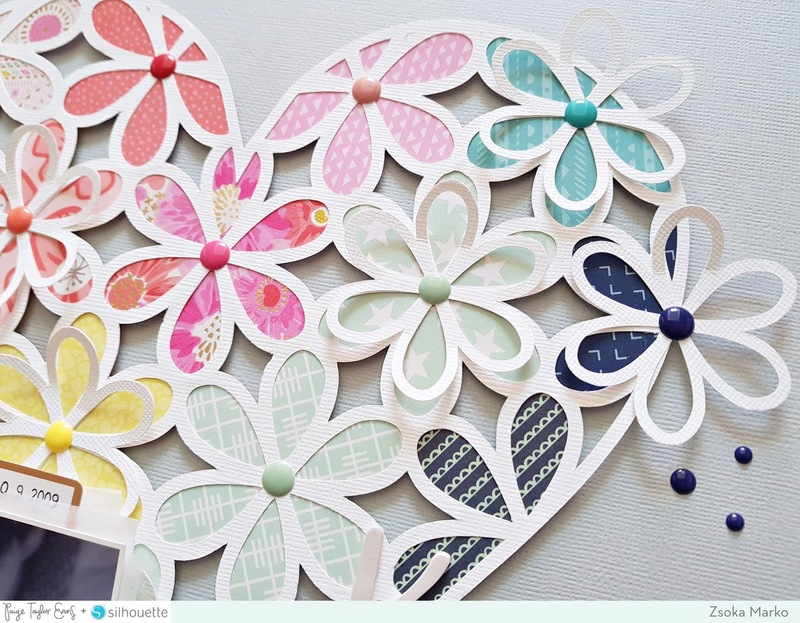 I cut it from white cardstock as usual and backed all flowers the same way, with the same 5 papers. I arranged these papers in a rainbow kind of order, from light to dark, if that makes sense. 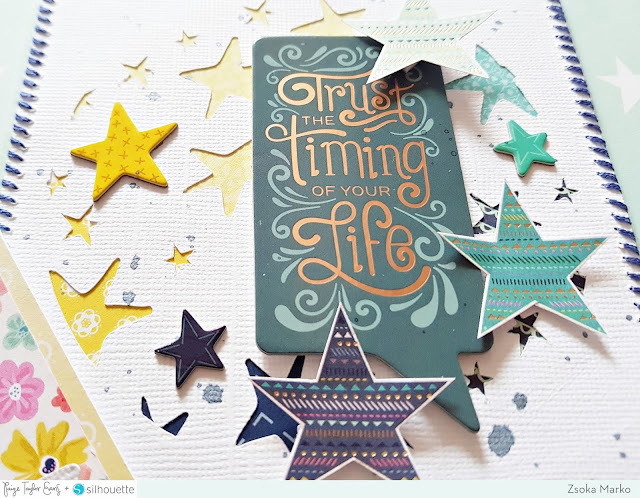 I then adhered the cut file to my background, for which I chose this stunning light blue paper. To bring out the turquoise in the petals more, I added a strip of the same paper to the left side of my page. I used this as a mat for my big title. I layered two tags and some tissue paper behind my photo. I added a couple of puffy stickers, labels and die cuts on and around my photo. I wanted to keep embellishing to a minimum since the background is busy enough already. There's so many amazing embellies in this collection again, it was hard to choose only a couple! I stamped the date and wrote the location on a die cut. I didn't add journaling because this picture is a part of a photo series and I would write the same thing on all of them! 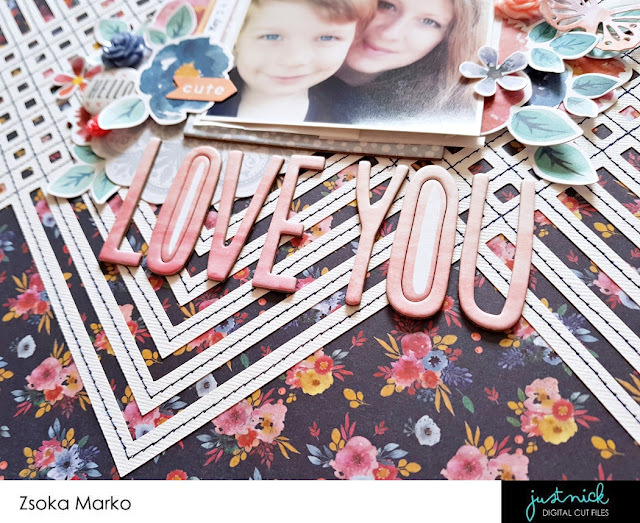 I hope you like this layout! 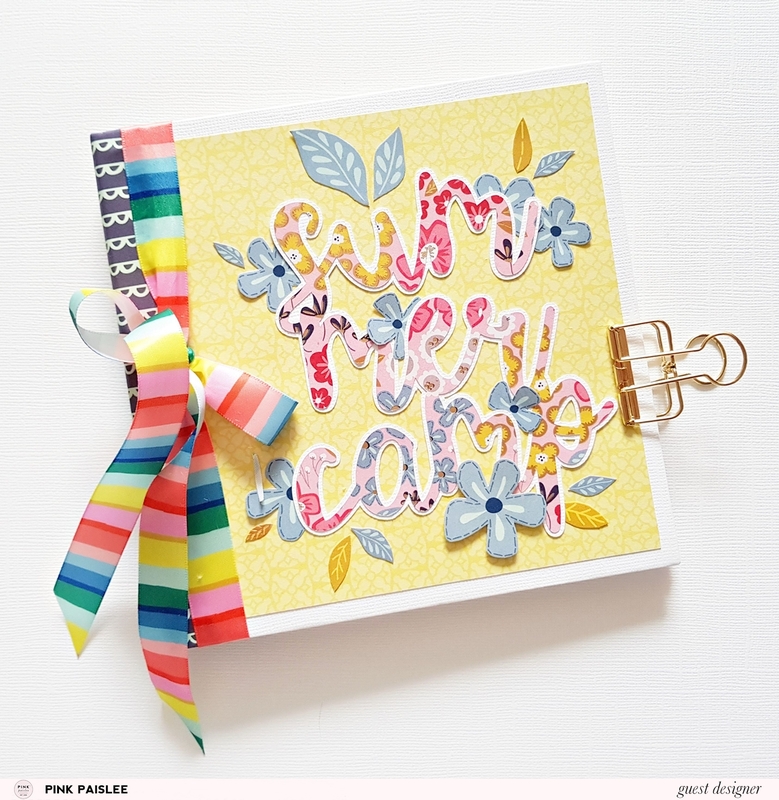 Thanks for stopping by today and happy crafting! 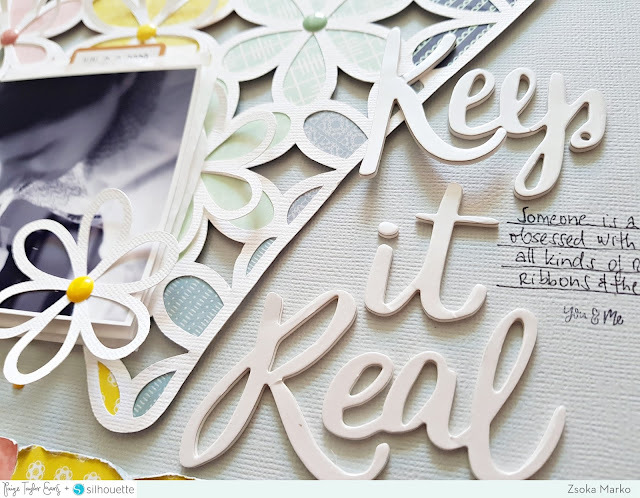 I'm back with a new layout I created for the Paige Evans + Silhouette DT. I chose the Flower Background cut file for this. I also used a heart from Hearts in Heart. I like to manipulate cut files so that I can use them different ways. I made a video showing how I created this particular file. I'm sure there's easier ways to do this, but I'm no pro by any means and this is how I know how to do it. I hope it helps. I cut my file from textured white card stock, then backed the flowers with different patterned papers. I chose as many as I had flowers then went from white(ish) through pinks, yellows, mints and blues, if that makes sense. Then I added foam adhesive to the heart so that it pops off the page. I also cut some flowers in a smaller size and did not back these. I just wanted to add a few on top of the background flowers to create some dimension and an airy feel. I went through my huge stash of enamel dots and matched them to my papers. I added one to each flower to create centers. Then I searched for a ready made title because whatever title I came up with related to my photo just didn't look right. I do prefer creating my own titles but since I prefer short, one word titles, it gets boring pretty fast :). 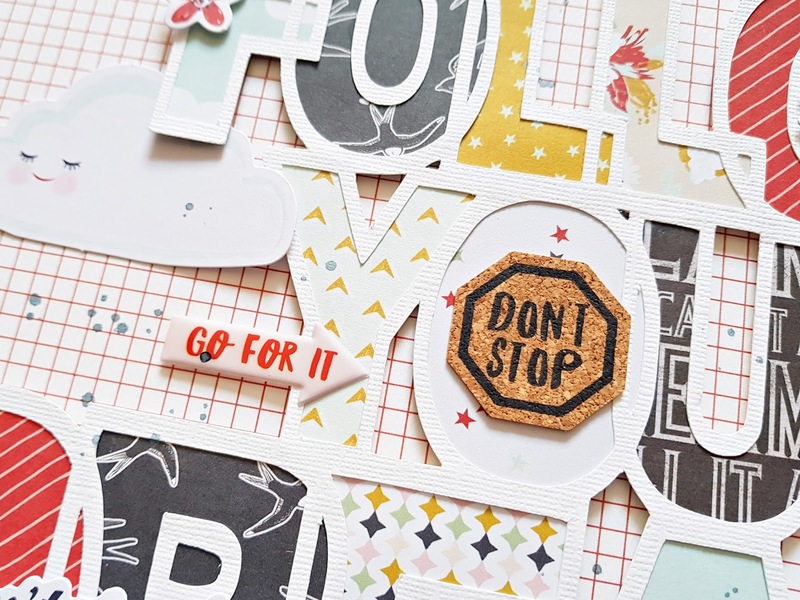 I found this white foam phrase in the Take Me Away collection that said Keepin' it Real. Eventually I had to shorten it because I had no space. I love the shiny pearl finish on these phrases! 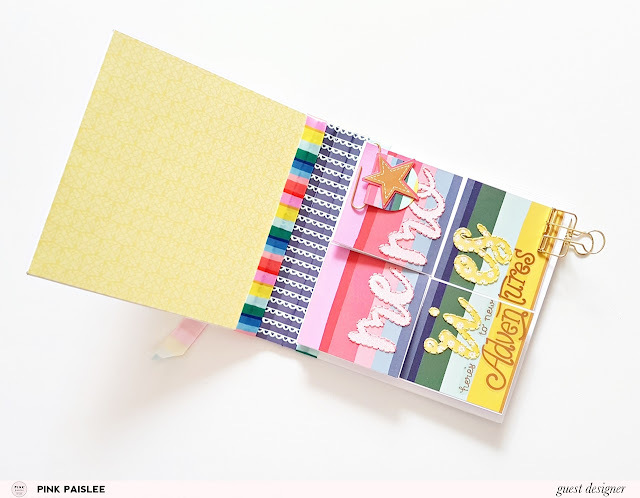 I often add a strip of paper somewhere along the edges, bottom, top or side. 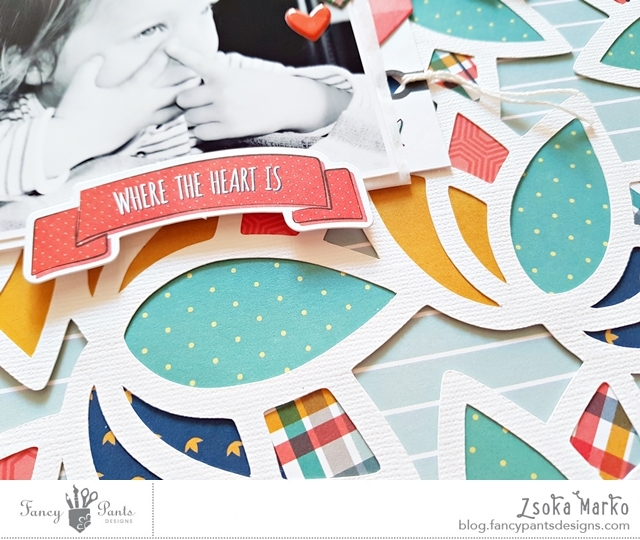 I just like a pop of color or some contrast to the rest of the layout. 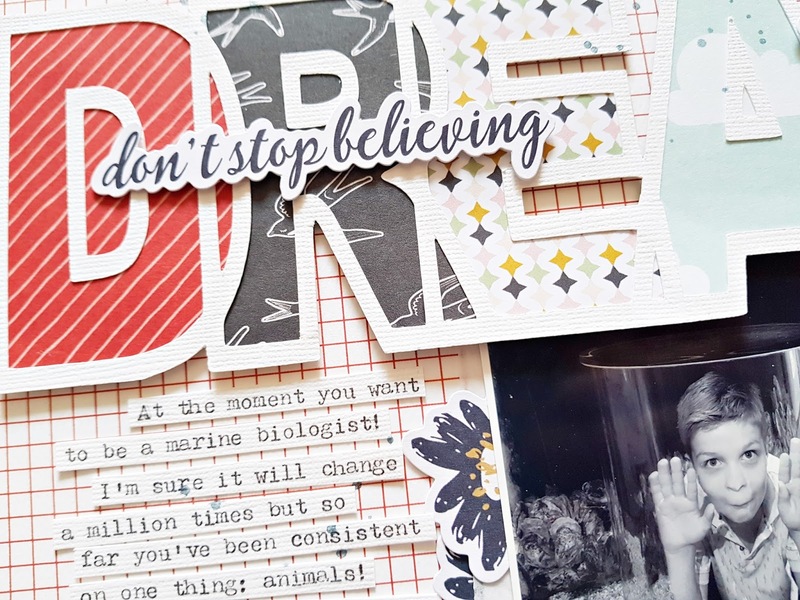 I actually wanted to go with the grey patterned paper from the Turn the Page collection for background but to my horror I did not have any left. 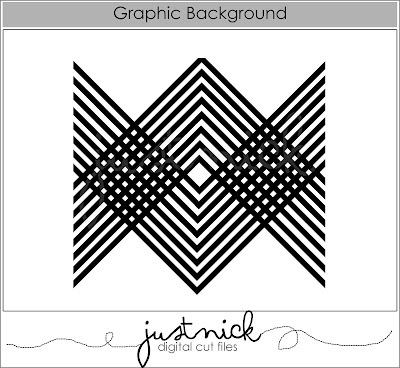 So I had to resort to a light grey card stock and this didn't give me the pattern mix I always go for. Hence the paper scraps at the bottom. 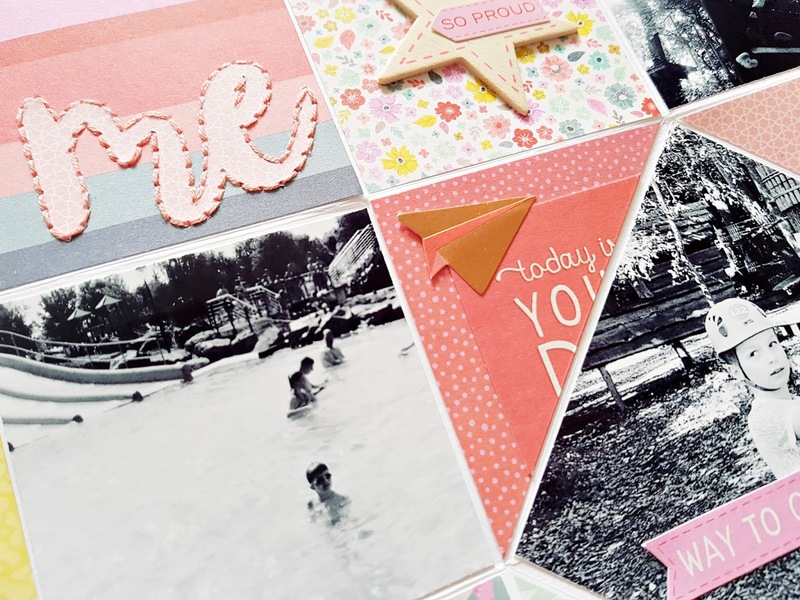 I hope you like my layout and are inspired to get crafty! Guesting for Pink Paislee - yay for second chances! 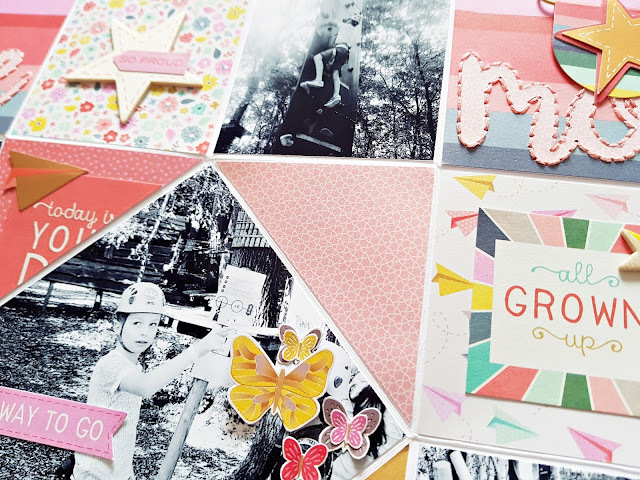 If you've been following me for awhile, you might remember that in February 2016 I was guesting for Pink Paislee with the beautiful C'est La Vie collection. 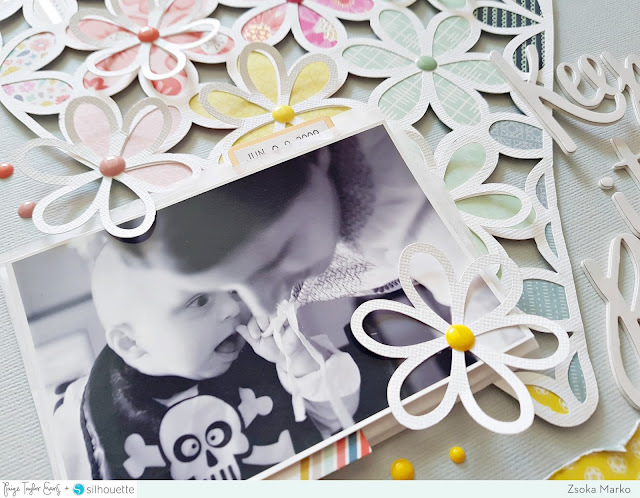 Back then I wasn't using very feminine collections to scrap my kiddo's pictures so I used my best friend's twins photos for all these projects. However I had to blur out their faces for reasons I don't want to discuss. The night before my post was going up I was informed that the layouts cannot be posted with blurred faces. I was devastated but my best friend was more important. I've created this page in memory of my beloved grandparents, who I spent a lot of time with as a child and were very important to me. They had this photo above their bed in a big size and it was always my favorite! Luckily my aunt had it in a smaller size and took a photo of it for me. I edited it a little and it didn't turn out as bad as I thought it would, considering that it's over 70 years old! I chose butterflies to symbolize they are in heaven. 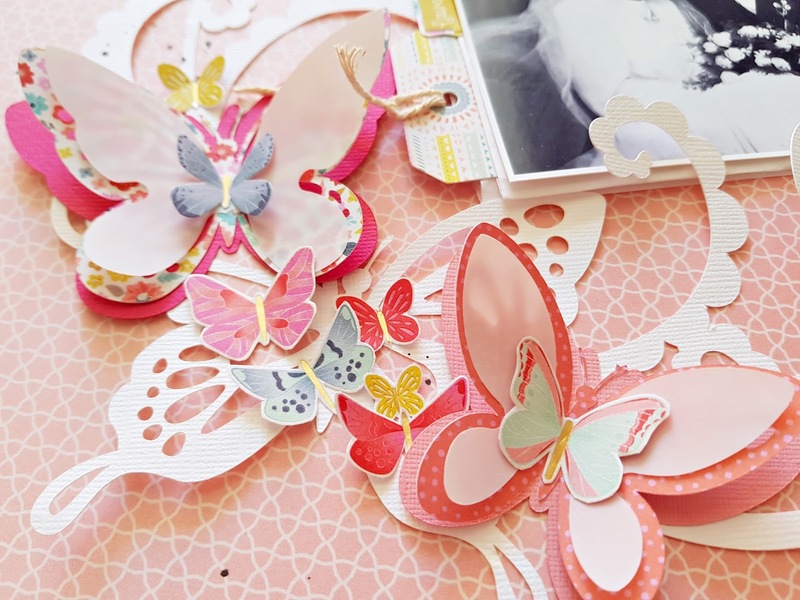 I used two different techniques to create my butterflies, die cutting and fussy cutting. 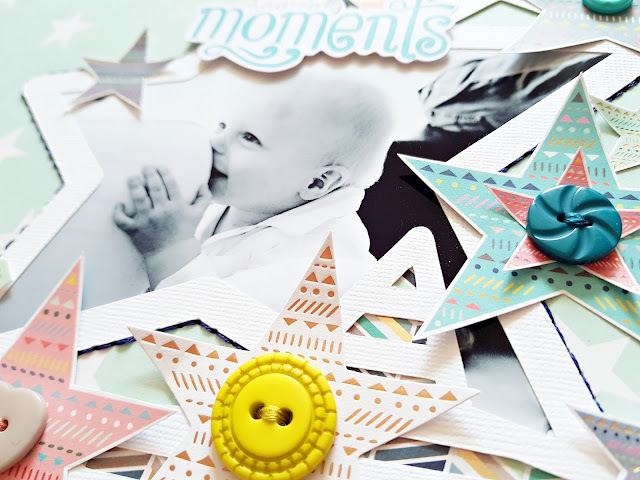 I love scrapping my kiddo's baby photos, he was so adorable! These pages make me smile! 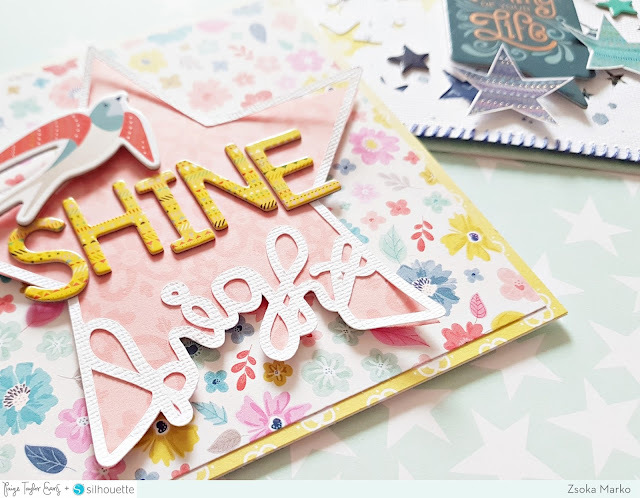 Again, I used a cut file as well as fussy cut stars from both a 12x12 and a 6x6 paper to have a variety of sizes and shapes and did a bit of hand stitching to add definition and texture to the big star with the photo. This one chronicles a happy memory in Sicily - my son just learnt to jump off pavements and was so proud of himself! I did what I always do: I used a cut file, backed it with different papers from the cute 2x2 pad and to frame my photo I added lots of die cut flowers and other embellies in several layers. 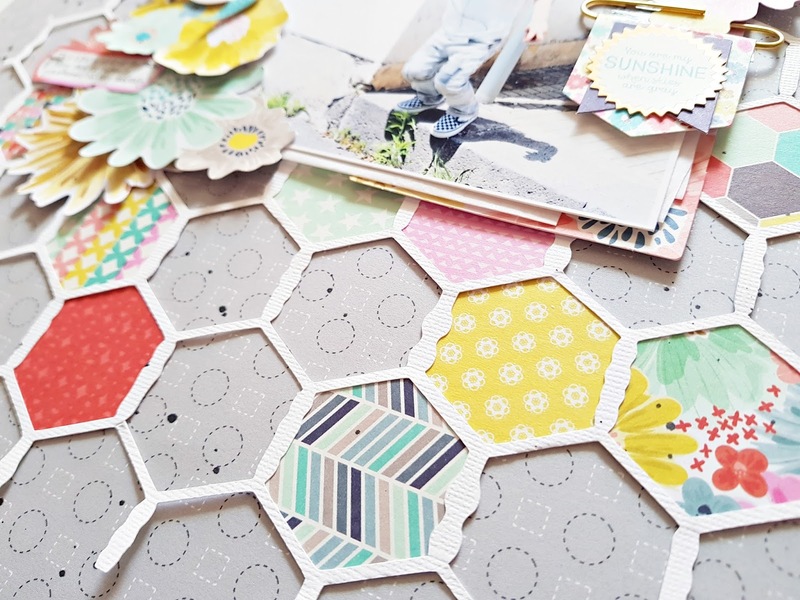 Recently a dear Scrapbook Werkstatt Design Team pal of mine, Birgit Krasenbrink created two awesome minis with a pop up insert and a tutorial to go with them (it's in German but it is pretty self explanatory, so be sure to check it out!) and I wanted to try to create one too! 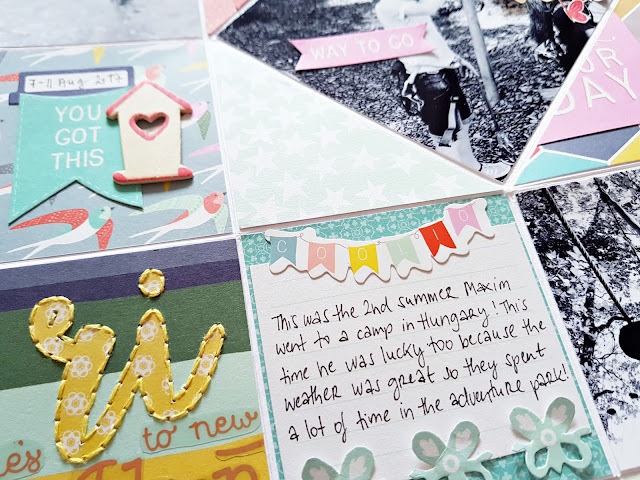 I documented my kiddo's summer camp memories in this mini - the photos are bad quality but I was happy that I had a friend at camp who sent me photos to allow me to take a peak into my kid's fun-filled days! 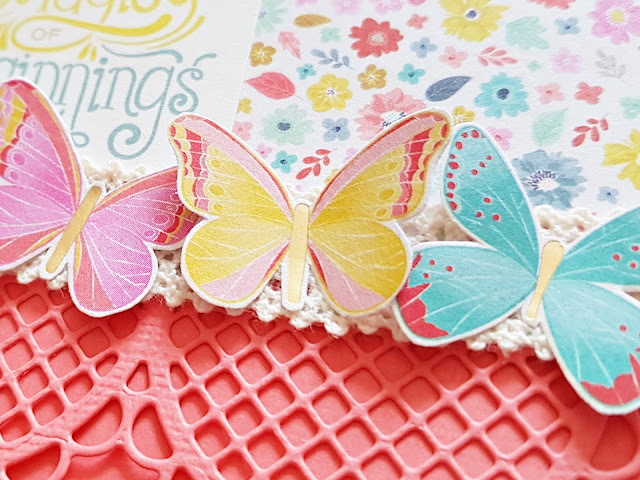 I used my favorite techniques, die cutting, stitching and layering! 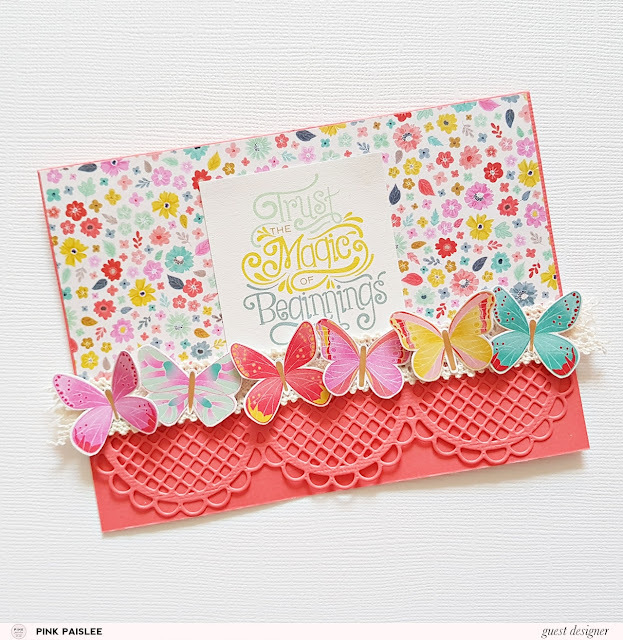 Usually I create more complex cards than this one, but I felt this didn't need more...I used a metal die to create the scalloped edge, then adhered a piece of pretty floral paper on the base together with my sentiment, for which I used one of the 2x2 papers. 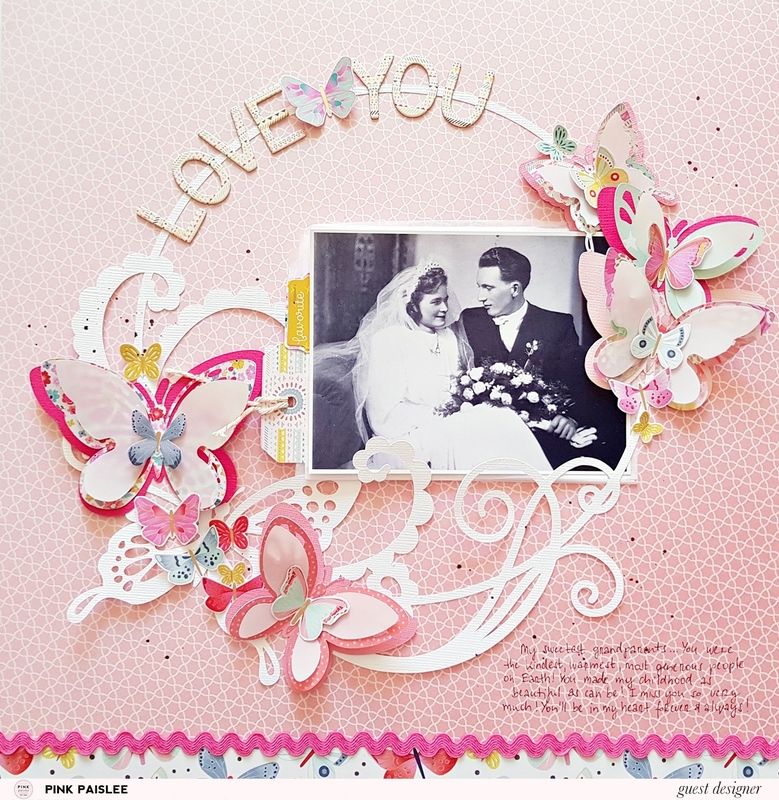 To finish it off I added a piece of the stunning lace ribbon and layered some fussy cut butterflies over it. Thank you so much Paige and Pink Paislee for this wonderful opportunity! I loved working with these products! I hope you guys like my projects!